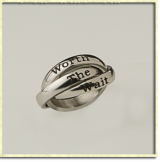 In 1995 Paul began to incorporate purity rings in Worth The Wait programs. 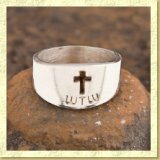 Purity rings were and still are a very important way to help students keep their commitment to Biblical purity. After doing over 1,000 commitment/purity ring ceremonies since the beginning of Worth The Wait, it is still moving to see parents put purity rings on their child's finger at the end of the service. 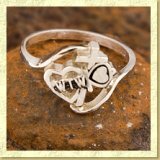 Worth The Wait purity rings are now worn by tens of thousands of students nationwide and are the "gold standard for Christian purity rings. 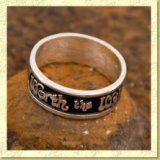 Before production of new purity rings, each purity ring is run before a teenage test-group to be sure of their attractiveness to teenagers and of their significance. Worth The Wait made sterling silver purity rings for 17 years. 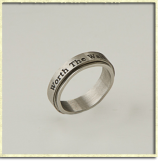 Due to the rising price of silver and the recession, in 2012 we began making our new purity rings out of stainless steel. We found that it made little difference to students and our new stainless steel purity rings are just as attractive and meaningful as the sterling silver purity rings!